Despite the hymn tune name NICAEA, the hymn itself smacks more of a poetic Athanasian Creed (and much shorter than the verbose Quicumque Vult) in its Triune thought than it does with the Nicene Creed. With a song so economic in wording and reflective of arguably the most complex concept of orthodox Christianity, one may ask, “how is it still so popular maintaining its textual and melodic integrity in world where change is constant?” In the 1990s a popular radio program on National Public Radio was Performance Today and on the show there was a segment titled, “What Makes It So Great?” where the host Martin Goldsmith would take a popular classical work, often from the romantic period and ask musicians and composers of the day to analyze and answer the question, what makes it so great? 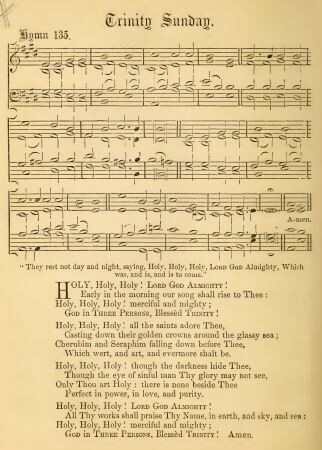 In this article, a short look is taken, historically, aesthetically, and textually to try to understand what makes this hymn so great. The cold water of his bath, juxtaposed with his body heat in the stifling Calcutta weather, sent Heber’s body into a massive fatal stroke on April 3, 1826. However, though Heber was no longer earth-bound, his legacy is still deeply felt. Reginald Heber was a prolific writer and his death in many ways became a rallying point for missions in the Victorian era, with Heber’s mission hymn, “From Greenland’s Icy Mountains.” However, it would be his text of “Holy, Holy, Holy” that would be the most enduring and beloved. The love comes from a wedding of music aesthetics and careful and judicious writing. Though this article is most certainly about the hymn (lyric) and not the tune (NICAEA by John Dykes), it has been nearly impossible to separate the two since they were first married together in Hymns Ancient and Modern in 1861, that “marriage” would be officiated by William Monk, the editor. The tune name NICAEA may actually have less to do with its Trinitarian leanings than the fact it was traditionally sung after the recitation of the Nicene Creed. Originally the tune used for this text was the more aptly named TRINITY, composed in 1850 by John Hopkins, its harmonic layout is much like that of NICAEA. As this writing is not a platform for a stronger musical exposition of NICAEA, the article, “A Musical Analysis of John Dykes’ “Holy, Holy, Holy” (NICAEA) by Timothy Shafer” will serve as a strong musical accompaniment to this hymn analysis. The first stanza, “Early in the morning, our song shall rise to Thee.” begins a clear offering of praise to the Triune God. This morning praise is prefixed by the chorus given to us by the cherubs and seraphs in Isaiah, chapter six, verse three. “Holy, Holy, Holy! Lord God Almighty.” This triune chant will precede nearly every verse. “Though an economy of words, the second stanza suggests a congregation in church: as in Ezekiel 1:1, the hymn is beginning with time and place and circumstance, and ending in mystery and wonder. Heber contrasts the earthly worship with the endless majesty and magnificence of the Holy Trinity, using Revelation 4: 6 — ‘And before the throne there was a sea of glass like unto crystal’. William Law, In The Spirit of Love (1752–4), had turned this into ‘a glassy sea’, and Heber uses the same phrase to indicate heavenly, as opposed to earthly, worship:” (J.R. Watson, The English Hymn: A Critical and Historical Study, 324).